On 29/5/2015 the school has reopened. We got a new principal madam who is very hard working and kind enough. Students enjoyed and were happy to come to school with a full enthusiasm and energy. The students who came to school first has received prize as a pen. This turned the students of mind to come to school from first day itself. 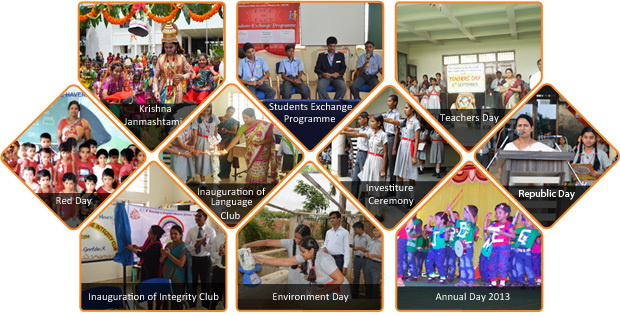 We the teachers and students have celebrated world environment day on 05/06/2015. This cultivated in the students as they have to save our environment. Along with to keep the school premises green and neat. Students participated in drama to convey the message of advantages and limitations regarding environment. All had a very meaningful time on the occasion of world environment day. Even teachers and students planted a tree. The red colour day was celebrated on 26/06/2015 for K.G section. It was inaugurated by our Principal Madam. All students of pre kg, LKG & UKG were part of it & they enjoyed a lot. All kids were dressed up beautifully in red colour. 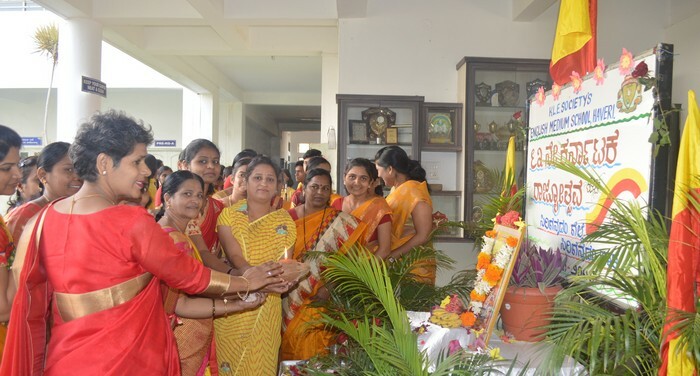 On 15/7/2015 we celebrated a Fruit day and our Principal Madam had inaugurated. All kids brought the pictures and charts of different fruits and few kids spoke about their favourite Fruits and we gave the knowledge of how important is fruit to keep our self healthy. Video clippings of MOM and working system of Rocket, when how and where MOM started was demonstrated for all the students of our school in the presence of our Principal. 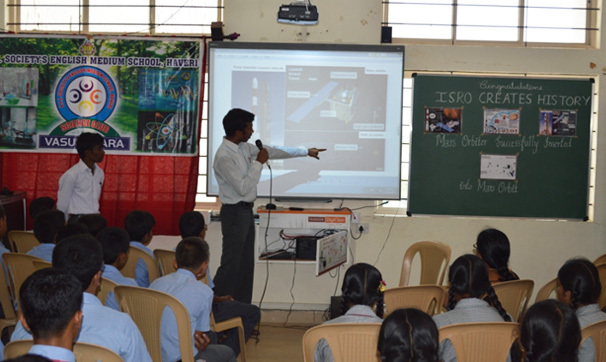 The session ignited the students’ mind to opt the field of Science and Research. Birth Anniversary of Bhagat Singh was celebrated on Saturday the 27th September 2014. District Judge Shri. 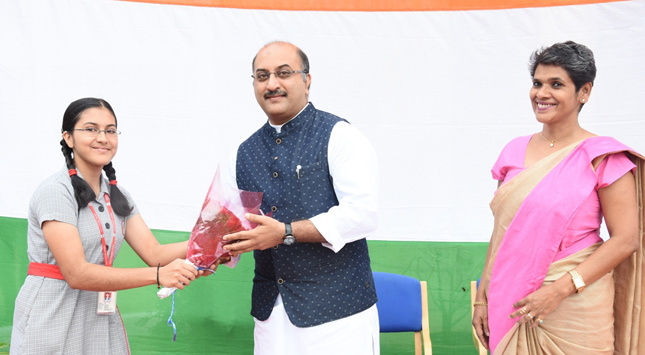 Shreeshanand, the chief guest of the function addressed the students and spoke about the disciplined life of Bhagat Singh. He also connected his talk to the present generation students, their life and lifestyle. He advised the students to use technology judiciously and make their life. 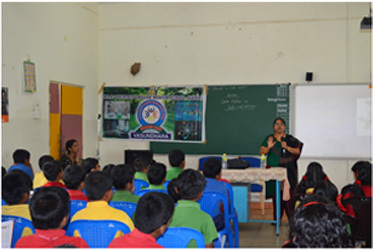 Karnataka State Pollution Control Board and KLES School, Haveri jointly organized a programme on 16th September on “INTERNATIONAL OZONE LAYER PROTECTION DAY” for the students of 9 and 10. 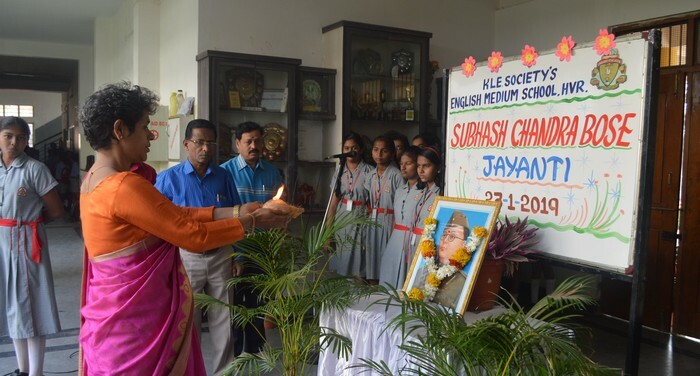 Chief Guest was Mr. E. Prakash Environmental Officer, KSPCB, Guests Of Honour were Prof. Shabana Banu, Chem. Dept. Engg. College, Devgiri.and Mr. Rajesh Asst. Environmental Officer KSPCB. Prof. Shabana Banu addressed the students regarding the importance of the Ozone Layer and role of students in protecting it. 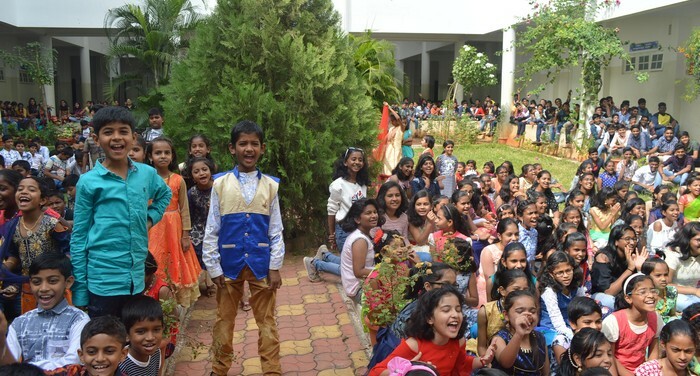 In order to exchange the academic methods and thoughts among the students of KLE Schools there was an Academic Exchange Programme arranged by our KLE School, Haveri. KLE School Gadag, Dharwad and RPS Jamklhandi were invited for the programme. 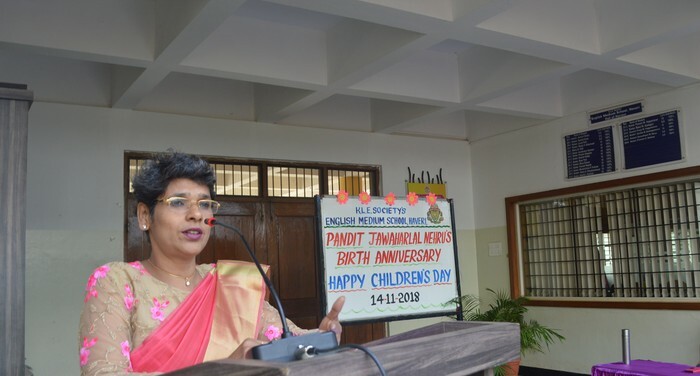 The programme was hosted by our school and the chief guests were the principals of the invitee schools Mr. Basavaraj Nyamagowda, member Board of Management Royal Palace School, Jamkhandi, Mrs Rita Jainer, Principal, Royal Palace School, Miss. 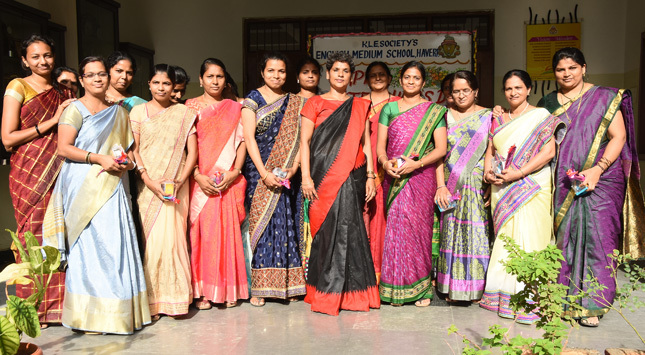 Kavita Kulkarni, Principal, KLE School, Gadag and Mrs. Shubhangi More, Principal, KLE School Dharwad. 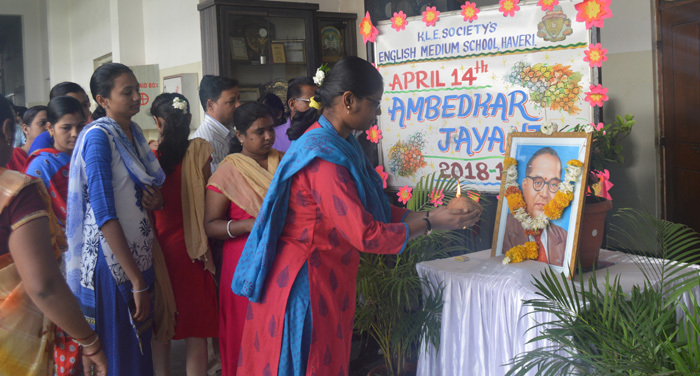 Events like Group Discussion on Social studies, PowerPoint Presentation on Biology and Dramatization of the Novel “The Story of My Life”- Hellen Killer were conducted in the morning session. Quiz competition and Seminars on the trigonometry topic were conducted during post lunch session. 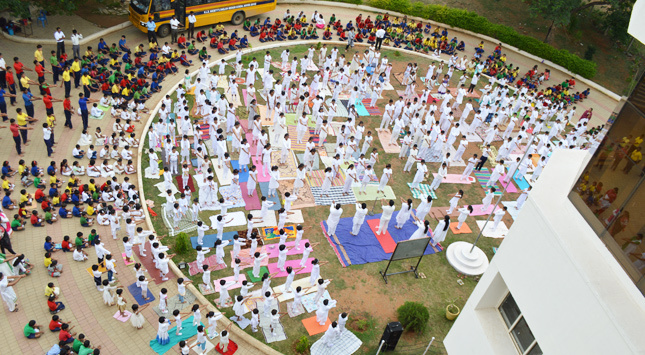 125 students participated in the programme. Teachers Day was celebrated with great enthusiasm. 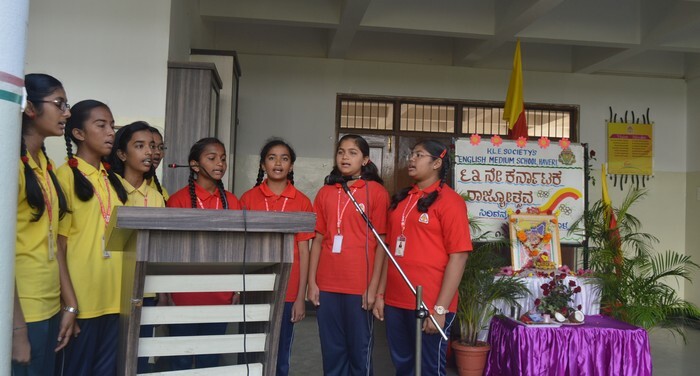 To mark the importance of this day –“Gurukuladalli Shankaracharyara Nudigalu” and also the 34 stanzas from “Bhajagovindam” was sung by few students from UKG to grade 4 and they disguised themselves as Shankaracharya, Shakuntala and many more and performed in the programme. 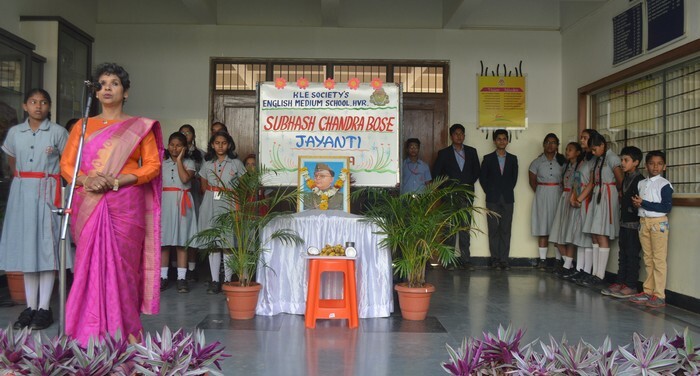 The programme was directed by Mrs. Rekha V Shirur, Assistant Teacher. 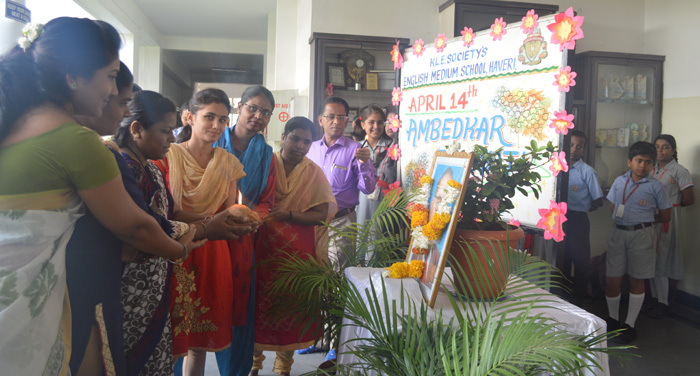 The students of Grade 10 hosted the “Teacher’s Day Celebration”. On this day teachers conducted the assembly like students did. Students organized various competitions for the teachers like 45 second game (eating buns), fish pond and fashion show. On the same day there was Speech by Our Beloved Prime Minister Narendra Modi addressing the students of north Indian States. Live telecast of the same was watched by students of grade 8,9 and 10 along with all the school teachers. 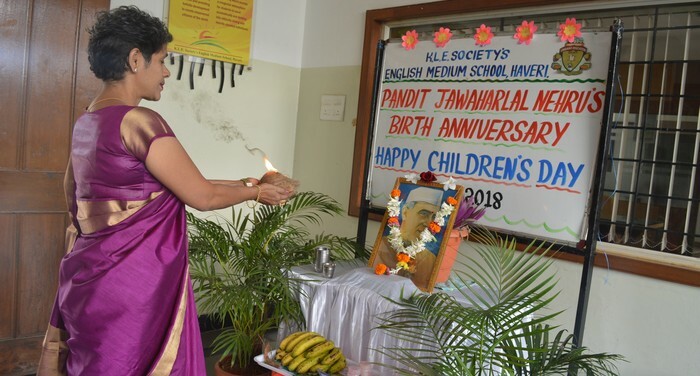 KLE Society’s English Medium School through under the able guidance of Mrs. Saroja B Shillin has awakened the citizens of Haveri to give good education to their children. This has become possible because she is a perfect teacher. She is guided by our beloved schools Coordinator Dr. Mrs. Preethi Dodwad. Both are acting like teachers to guide us and impart good education to Haveri children. In view of this on this auspicious occasion of teacher’s day, we the staff of KLE and citizens of Haveri wish to convey our Heartfelt Teachers Day. 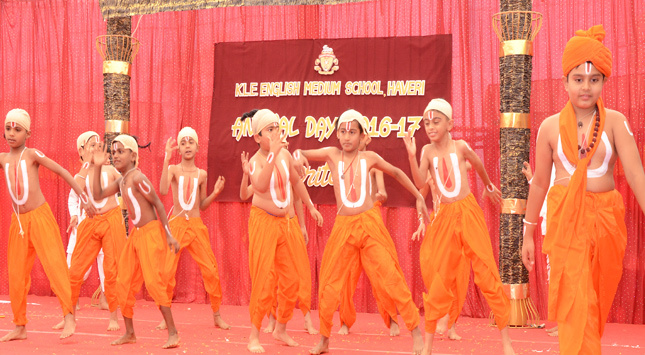 Our school celebrated Shri Krishna Janmashtami on Saturday the 16th August. The celebration started traditionally by performing Pooja to the Photo of Lord Shri Krishna. 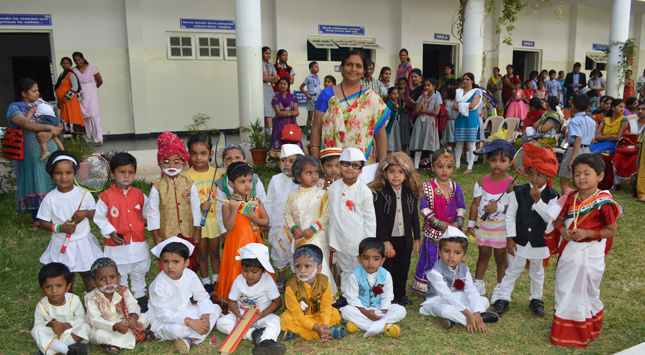 On the occasion kindergarten students were dressed as Radha and Krishna. 68th Independence Day was celebrated with great fervor. Our beloved Principal Mrs. S B Shillin hoisted the National Flag and addressed the students about the importance of the day and their responsibilities towards the progress of the nation. 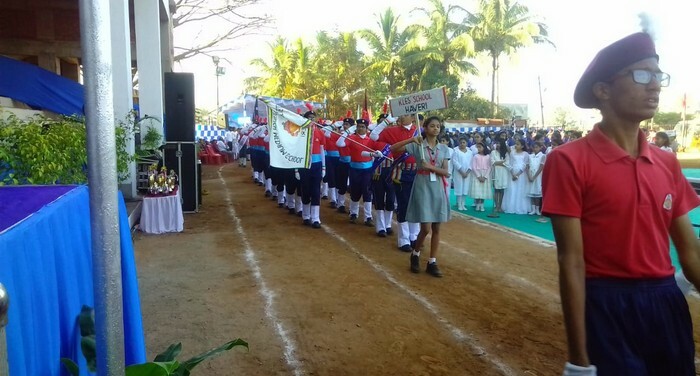 On the same day at district Muncipal Ground 180 students of grade 7, 8, 9 and 10 of our school enacted the entire Freedom Struggle from 1857 to 1947 AD with great Patriotism and enthusiasm. The act was appreciated by the D C and Public of Haveri. The mesmerizing act left the crowd spellbound. 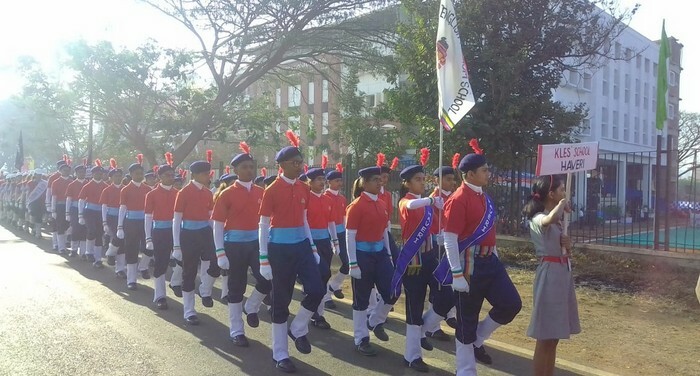 Our school guide students bagged the 1st prize in the March Past. On 21st july 2014 School Parliament Monsoon session was held. All the committee heads along with their members were present. Principal Mrs. S B Shillin was present. Miss. Deepika S Naik was the Speaker. The session was guided by Master Prajwal A C and Master Anand M M presentees of CBSE International Life Skill Summit. 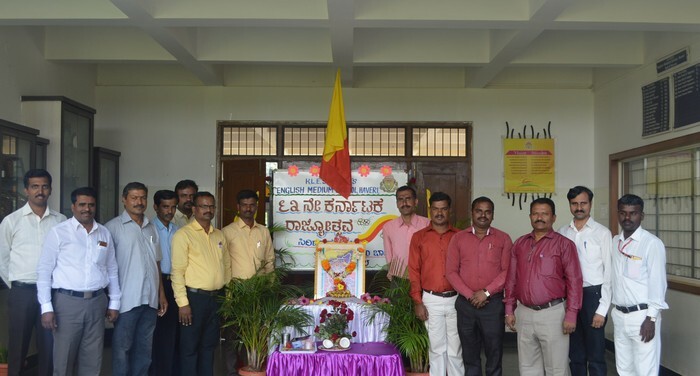 KLE School, Haveri and District bar association; Haveri jointly celebrated Vanamahotsava and planted about 50 saplings in the school campus. Principal Mrts. 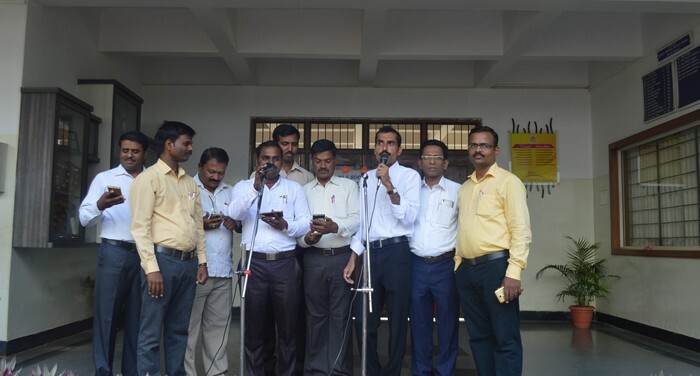 S B Shillin , Mr. N S Patil, parent President of District Bar Association, Mr. S Makare, parent advocate, Mr. Ashok, RFO and other team members and students of our school were present. 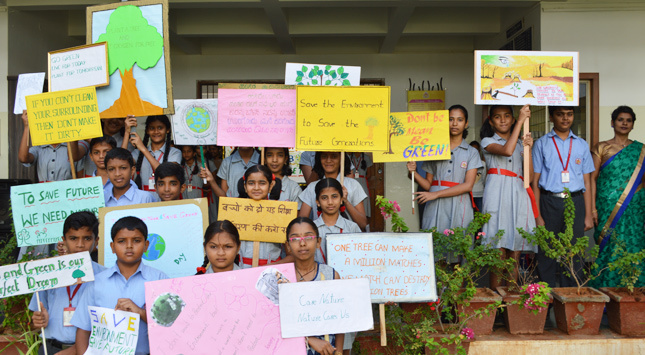 Karnataka State Pollution Control Board organized various competitions on account of World Environment Day and our school students bagged prizes in Drawing and essay writing. Guest lecture was organized for grade 4 0n July 16 on the topic “TEETH and MICROBES”. Guest lecturer Dr. Kalpana M S, parent, Government Dental Surgeon, gave the presentation on the topic. 104 students attended the same. 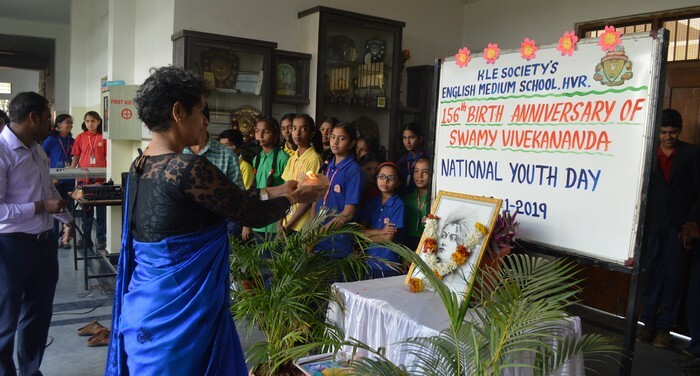 Mrs. Nagveni J R, science teacher of grade 4 organised the programme. July 1st is celebrated as Doctor’s day. Our school students of grade 8, 9 and 10 along with one teacher visited many government and private hospitals and greeted the Doctors with roses and red ribbon which marked rthe importance of the day. Doctors were overwhelmed. The school arranged book fair in coordination with the Share Win International, Kolhapur. Our Principal inaugurated the “BOOK FAIR”. It was held for two days. Parents and children visited the “BOOK FAIR” in large number and purchased the books and materials of their interest. The school received books of worth rupees 11000 from share-win international. On 5TH JUNE 2014 Niasarga. The Eco Club, celebrated the “World Environment Day”. Chief guest was Shri S B Nadagouda who motivated and encouraged the children to save, protect and conserve the natural resources. On the eve Eco Club planted 50 saplings around the school campus. The school was set ready to welcome the students. Newly appointed teachers and newly admitted children were welcomed with flowers and books respectively. 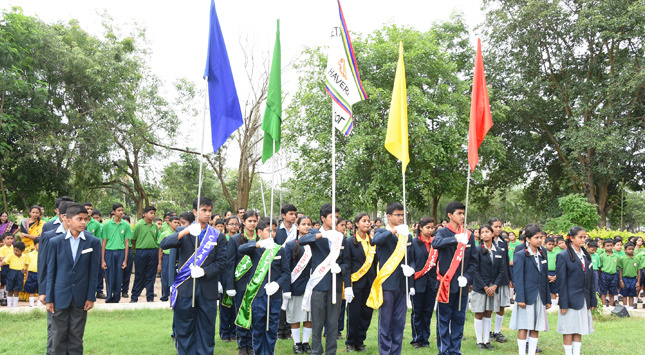 The assembly was held by 9 standard students. Prayer started with basaveshwara vachana. Birthday wishes were also sung. 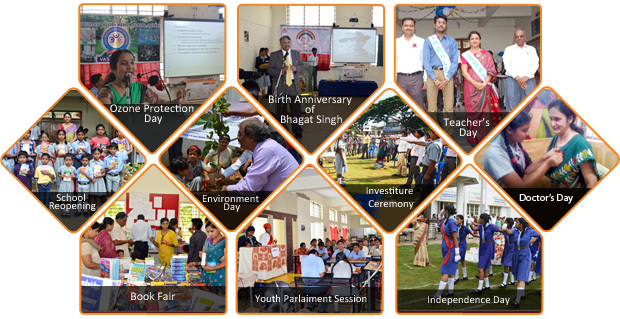 Annual Day celebration was held on 28th December 2013. 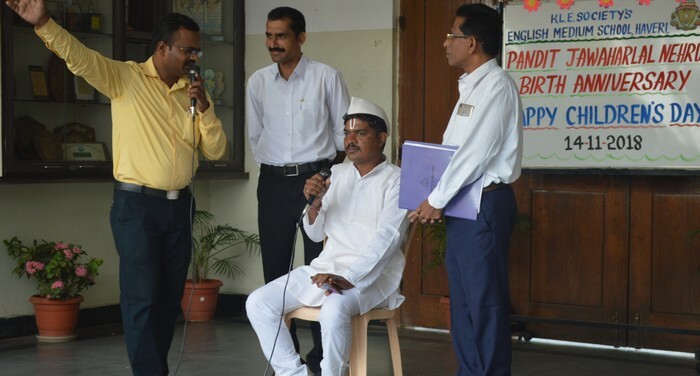 For KG to Grade IV the Chief Guest was Dr. Basavaraj. 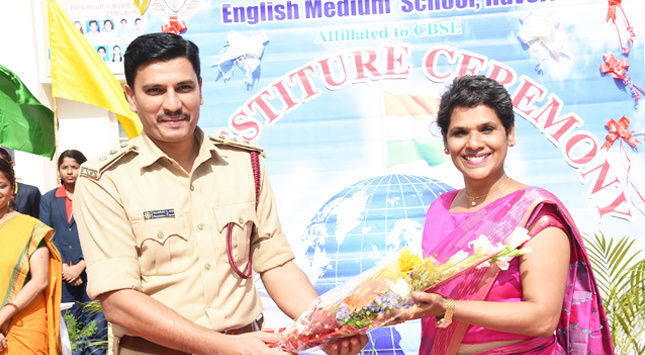 S. Anami ( Principal K.L.E Institute of Technology, Gokul, Hubli ) and for V to Grade X the Chief Guest was Shri.N.Shashikumar ( Superintendent of Police, Haveri ). 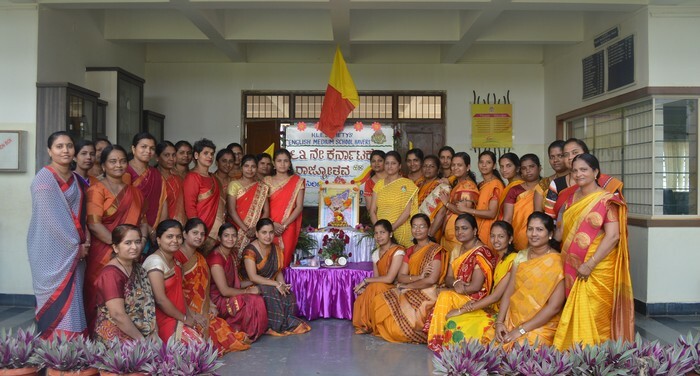 Teacher’s day celebration was held on 5th September. 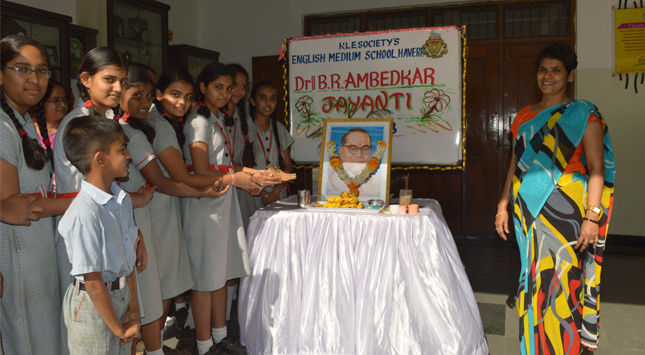 Programme began with Pooja to the portrait of Dr. S. Radhakrishna by the Principal. The gathering was addressed by inspiring the teachers to be the role models. Shir Krishna Janmashtami was celebrated by reciting ‘Geetopadesha’ by students of KG to VII, which was followed by a beautiful dance and breaking of Dhai Handi. Dr.B.C.Bannur, Principal, G. H. College Haveri, Director Board of Management K.L.E Society, Belgaum was there to witness the whole show put up with Grand Chariot where participants recited shlokas form Bhagavat Geeta. The credit of Geetopadesh goes to Mrs. Rekha Shirur Assistant Teacher of the school. 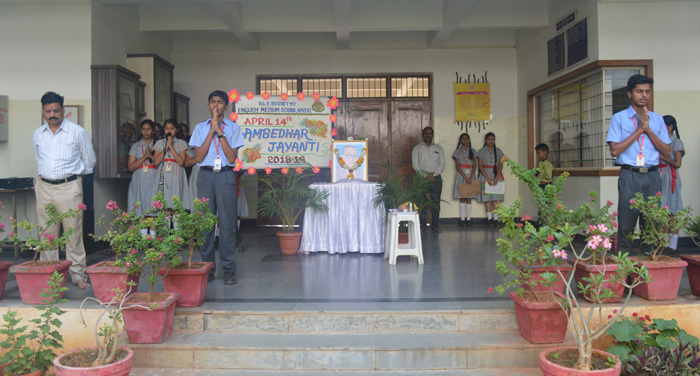 CBSE Science Exhibition was held in JSS Public School, Bangalore from 22nd August 2013 to 24th August 2014. Four students of our school participated in the exhibition. “Bad Effects of Smoking and Lung Cancer” was exhibited by Miss. Ranjita. S. S and Bhavana. B. S of Grade IX. Conservation of soil, water and energy was exhibited by Prabhudev. K. P and Rahul. M. A of Grade X. 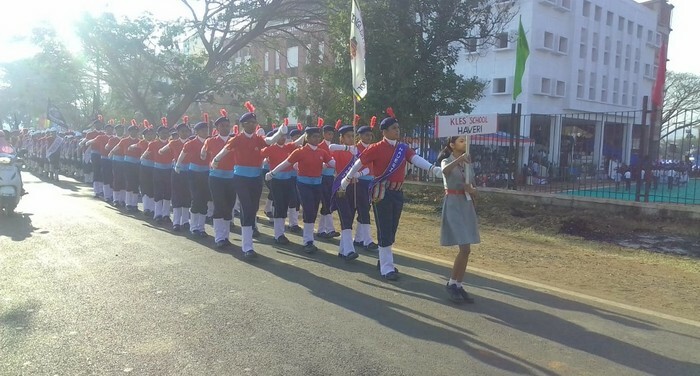 “Mera Bharat Mahan” Slogan echoed in the school campus as students, teachers and parents gathered for the independence day celebration on 15th August. Principal hoisted our National flag and addressed about the Freedom, Responsibilities of the students towards the nation. 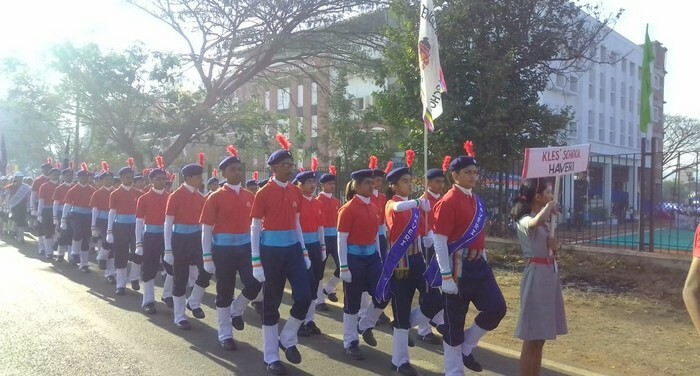 District level Cultural Activity was held on the same day on the Muncipal ground and our students bagged 1st place in cultural event and second place for guides march past. 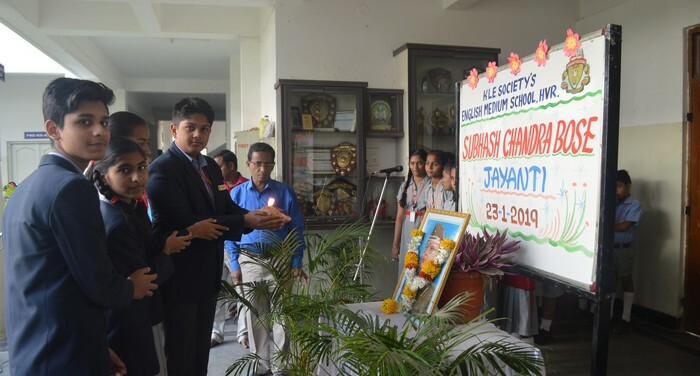 Inauguration of integrity club programme began with prayer song followed by lighting the lamp by the Chief Guest Mrs.Geetika Kharola Principal, K.L.E School Bangalore and President Mrs. Saroja B. Shillin, inspired the students with interaction about integrity club. 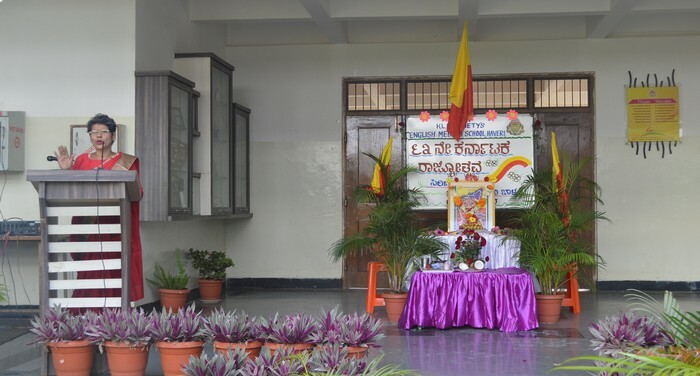 Inauguration of Colors Day was held on 10th July 2013 for Nursery students. In our school nursery kids were shining in Red Color. Main aim of this activity was to give the knowledge of colors and fruits. 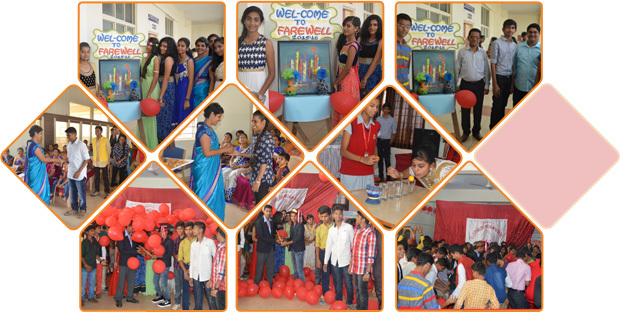 It was a beautiful red color day with lot of hope for a bright future to our nursery students. 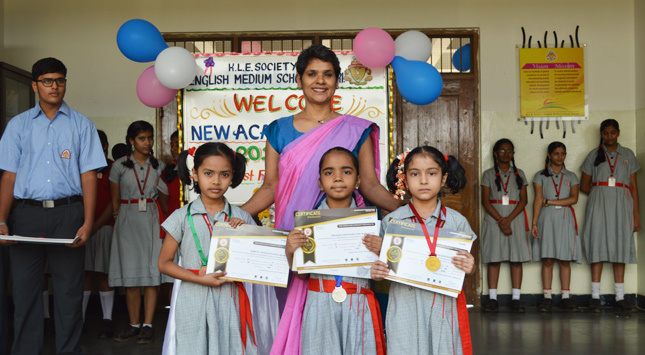 Investiture Ceremony was organized on 6th June in our school. Newly elected students were excited on this beautiful morning. 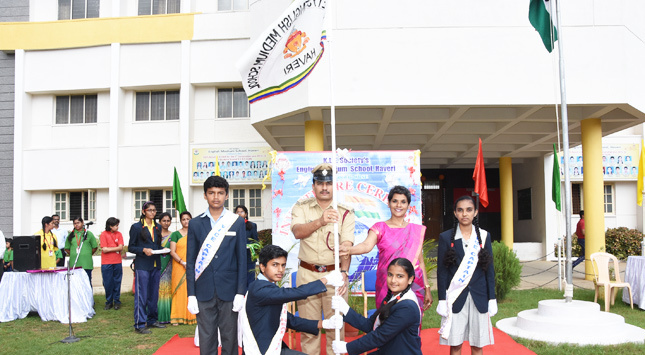 School Head Boy Master Anand M. M and School Head Girl Ms.Pooja M. V, Vice Head Boy Master Manjunath M. S, Vice Head Girl Ms. Rajani Solemnly affirmed on the oath that they will respect the ideas and Principles of the School’s sovereignty, unity and integrity. The 2013 theme for World Environment Day is Think, Eat, Save. This year the country hoisted in Manglia, on 5th June 2013, World Environment Day, Nisarga, Eco-Club started the vermiculture, which is a very good idea to make the K.L.E CBSE School, a Eco-Friendly School. 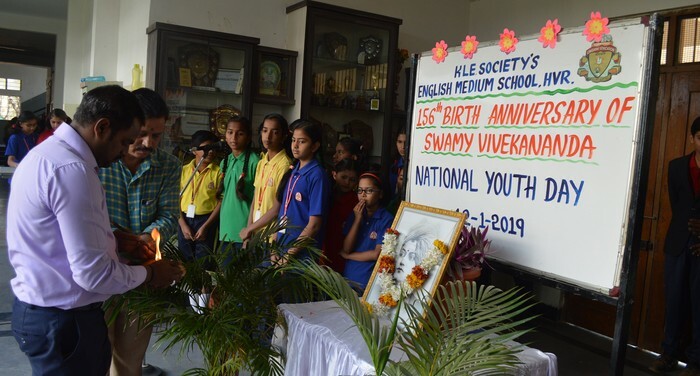 The Vermicelli pit was inaugurated by leaving earthworms into the pit on this day by Chief Guest Mr. and Mrs Hiregowdar accompanied by our Principal Mrs. S. B. Shillin all enthusiastic Eco-Club members and In Charge teachers. Orientation Programme was organized for teachers in our school. KG Section Training on Phonetics. Orientation Programme was carried on by the Principal Mrs. S. B. Shillin on “Vision & Mission”. “How to create school center of excellence”. Analysis of CBSE importance circulars on FA’s & SA’s, Project work, CBSE Manual & new implementations.